George “Johnny” Nichols won the Light Heavyweight Championship in the National Boxing Association’s tournament finals in Chicago on March 18, 1932. Johnny Nichols is pictured below with his long time manager Jack Singer. The March 19 Sandusky Star Journal reported that Nichols had only a “100 to 1” shot to win. Johnny defeated Dave Maier in the fight, but judge’s decision was not unanimous. Two referees voted for Nichols, but another judge, John Houghteling, cast his ballot for Maier. The crowd stood and cheered for Johnny Nichols when N.B.A. president John V. Clinnin linked the gold championship belt around the winner’s waist. George “Johnny” Nichols was born in Sandusky to Italian immigrant parents. He did much of his boxing in Buffalo. The Sandusky Register Star News said in a 1957 article that Johnny Nichols fought from 1927 through 1937, sat out a year, and had one final fight in 1939. Nichols had boxed in many towns including Boston, Miami, Los Angeles, Denver, and Houston. The obituary of John G. Nichols in the September 27, 1986 Sandusky Register listed John G. Nichols’ parents as Thomas and Ida Nichols, and his wife as the former Bertie Horn. The 1910 U.S. lists his parents as Thomas and Ida Nicholas; but the 1910 Sandusky City Directory contains a listing for Thomas and Agata Nicolosi. Variations in given names, surnames, and birth dates are all too familiar in family history research. Don’t rule out any data. The best thing to do is to keep a record of all the dates and spellings that are found, and document the source of each. Johnny Nichols was definitely born in Sandusky to Mr. and Mrs. Thomas Nicholas, but through the years names were changed. Johnny’s mother name was listed as Mrs. Ida Nicholas in her 1936 obituary, but Johnny’s name was listed as John G. Nichols with the Ohio Department of Vital Statistics at the time of his death in 1986. An interesting sideline about Johnny Nichols is his brief marriage to Kit Klein. The New York Times reported in 1935 that the national speed skating champion had married George Nichols, a boxer from Sandusky, but they had never actually lived together. 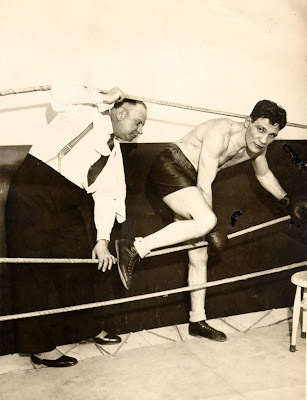 Another well known boxer in the early 1950's was the son of the Erie County Dog Catcher. Don't remember his name. Because he had such a powerful punch he broke his hand and had to retire from boxing. On the nationally televised "Friday Night Fights" he got punched over and over and then with one uppercut he lifted the other boxer off his feet and knocked him out. was a middleweight fighter in the 1950's. His father, Albert Lowry, was the Erie County dog warden for twenty years. Looking for any current infomation on Pat Lowrey, the "Fighting Marine"
Great article! Good tip on documenting the spelling variations found over time. Is there a way to research 1923-24 records of Nichol's fights in Sandusky/Ohio that are incomplete? I am from Buffalo and writing a book on the 6 world champs from here, Nichols being one. >>Is there a way to research 1923-24 records of Nichol's fights in Sandusky/Ohio that are incomplete? I am from Buffalo and writing a book on the 6 world champs from here, Nichols being one. 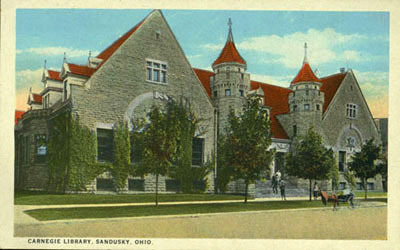 The only way I could think of would be to go to the Sandusky Library, or another library with Sandusky newspapers (Hayes Center, Fremont, OH, Ohio Historical Society, Columbus), and go through the newspapers on microfilm. Unfortunately, these newspapers are not indexed, so it would be a matter of searching through the pages to find what you want. Did you ever write that book on the 6 Champions from Buffalo? I would be interested in seeing a copy - I am the grandson of John Nichols.